Acting President Yemi Osinbajo, on Monday, said the Federal Government will soon rehabilitate the collapsed bridge, Tatabu in Mokwa Council Area linking Northern and Western parts of the country. He, said this when he and Mr Babatunde Fashola, Minister of Power, Works and Housing, inspected the collapsed bridge, advised motorists plying the road to exercise patience. The bridge along the road had collapsed on June 11, as a result of flood at Tatabu village in Mokwa Local Government Area of Niger state. 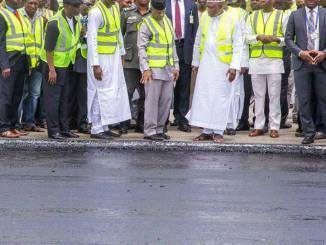 Osinbajo, who described the incident as unfortunate, said that the construction of an alternative bridge would be completed within 14 days to ease movement of traders and goods. “We have come here to look at the bridge because this road is very important to us as a government and this axis is very important to motorists and the country. “The Federal Government will make sure that the collapsed bridges along Tegina/Mokwa and Jebba/Mokwa roads are done immediately and all repairs on the roads are done. “We commend your patience and want you to continue to be patient with us, very shortly, the bridge will be completed within a forth night,’’ he said. The Acting President stated that adequate personnel had been mobilised to ensure quick completion of the collapsed bridges. “We are working on the two bridges as emergency and everybody is fully mobilised; government is committed to maintenance of all roads across the country,’’ he added. He, however, cautioned motorists against loading their vehicles above the approved road standard of 35 tonnes per vehicle.